The ADATA Dashdrive Durable HD710 is supposed to be one of the more rugged and survivable kinds of external hard drive in existence. 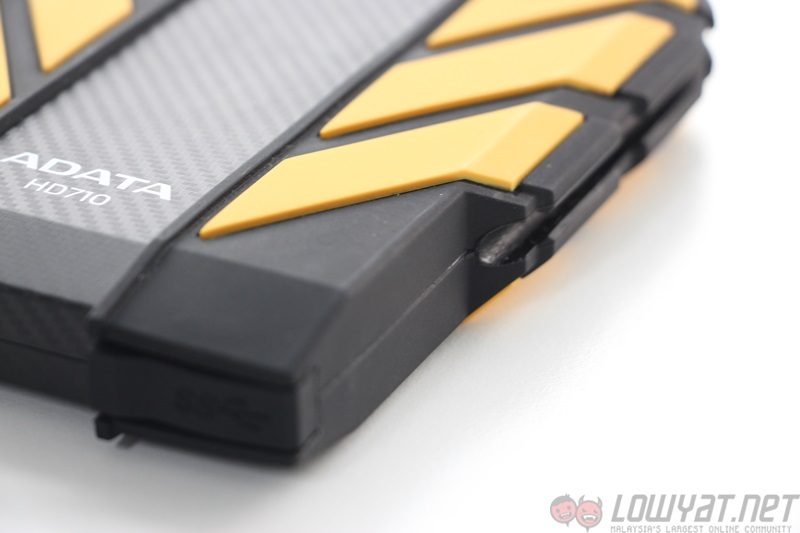 It is meant to be dust and water resistant, and ADATA even claims that the shock resistance is military-grade. Does this all add up to a worthy portable storage device? Well, that depends. 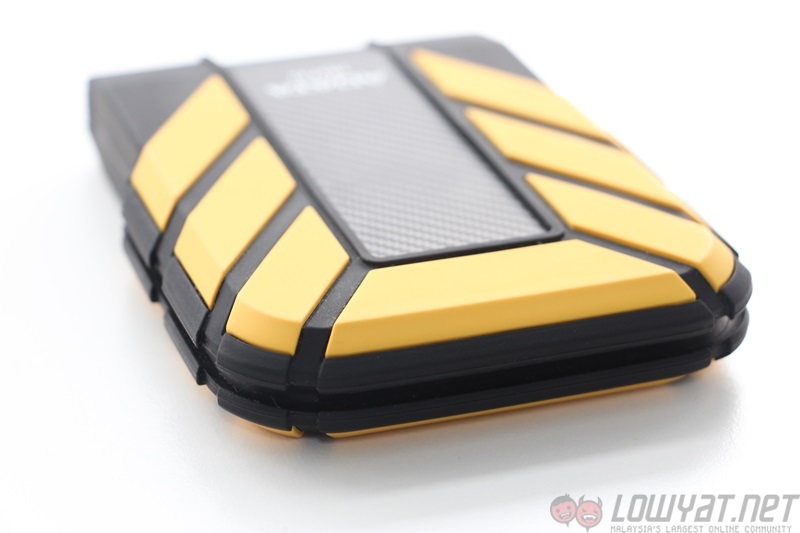 It is a 500GB/1TB external hard drive that is designed to withstand spills, drops, and dust. 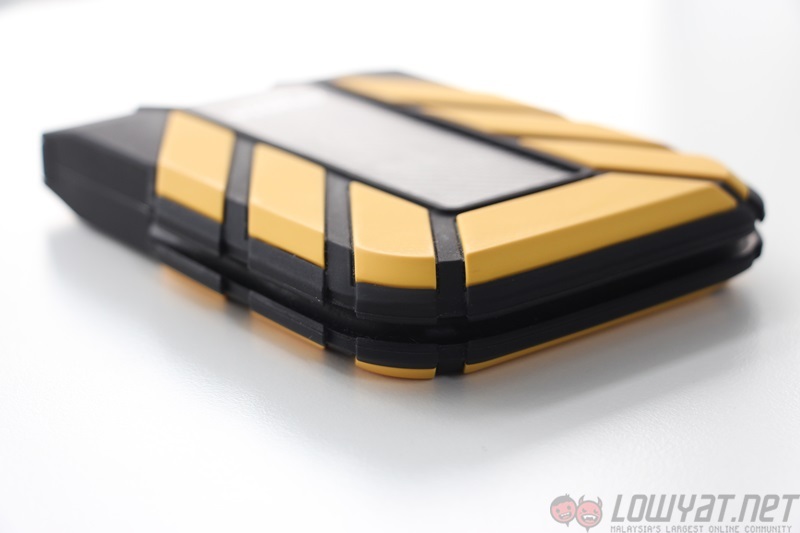 It is rated at IPX7 water resistance, which allows it to survive under one metre of water for up to 30 minutes. 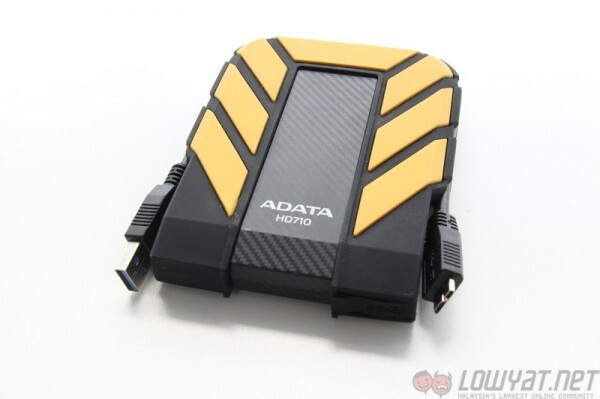 ADATA has also managed to get the Dashdrive certified for the MIL-STD-810G 516.6 drop test, which means it is capable of withstanding multiple drops from a height of up to 1.2m. This does not mean we were enthusiastic about abusing it at that level; especially since it is unlikely to be dropped all that much during its normal lifespan. The rubber cover provides the water- and dust-resistant coating; thanks to a flap covering the only opening on the Dashdrive – the USB port. One nifty trick the cover also provides is a holder to store the USB cable; which is nice, as the package does not include a pouch like many other external hard drives. It takes a bit of effort to ensure that the cable is secured in place though. The majority of the device is covered in rubber, which is obviously to protect the hard drive from accidental drops. 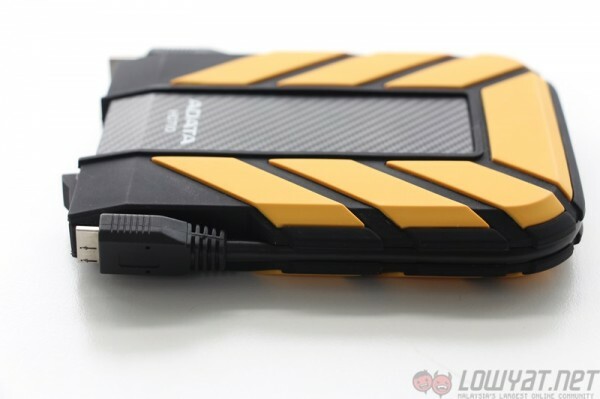 Surprisingly, it isn’t much thicker than normal external hard drives in the market, and is one trade-off I’m sure many wouldn’t mind. To fully ensure its water resistance, the flap covering the microUSB 3.0 port must be securely closed. Otherwise, this ADATA will not be able to safely store your data. As a storage device, the Dashdrive doesn’t vary too much from other designs on the market. Inside is a 500GB 5400RPM Toshiba drive which is common for a lot of these devices, while a larger 1TB option is also available. It isn’t a high performance deal here, banking on reliability instead. 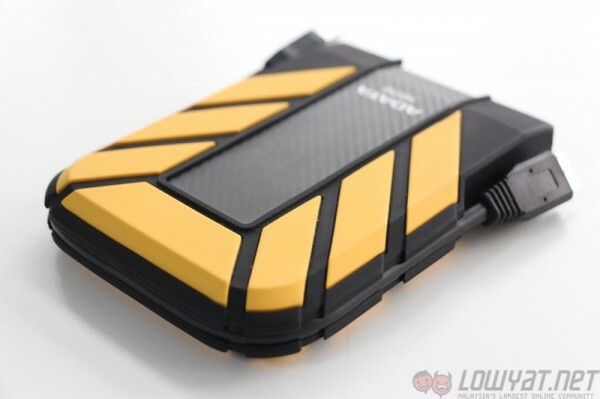 The interface is a 6Gb/s SATA connection, and the USB 3.0 standard allows for transfer rates of up to 5Gb/s. This of course means nothing if it ends up connected to the still-common USB 2.0 port that has much lower transfer speeds. 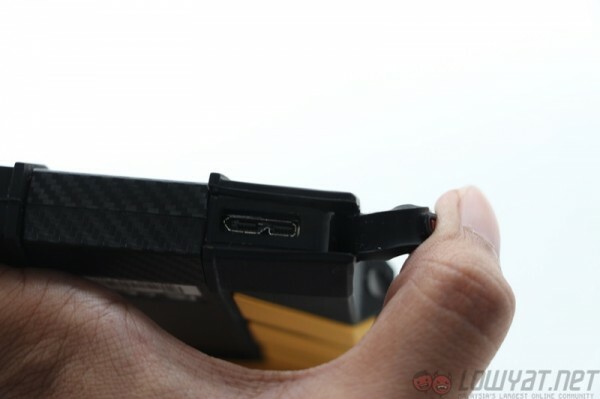 The protective rubber surroudning almost the entire device could also be one of the main weaknesses of the entire design as the glue holding it on our review unit began wearing out, starting from the bottom edge near the microUSB port, and didn’t quite secure the edges of the chassis. This lead to gaps between it and the plastic. It doesn’t actually affect performance in any way, but still a little disappointing to see happen. 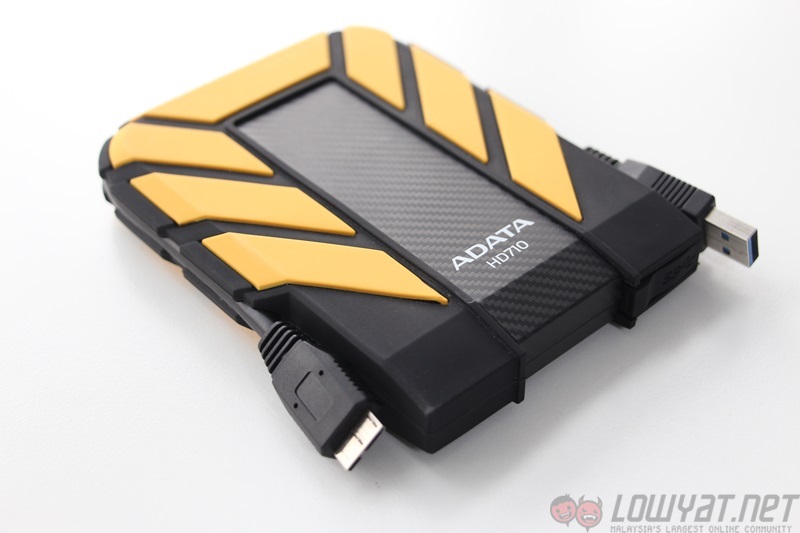 Overall, the ADATA Dashdrive Durable HD710 is a decent portable storage device that does what most consumers would want it to do. The water and dust resistance are not convincing as these sorts of things really aren’t exposed to the elements very often; although it could be a bonus for people who need to transfer large files while traveling in more rural areas. Drop resistance is probably the main reason for this to be an attractive proposition, especially for people who have kids or animals around; or are just in the habit of dropping things. With a retail price that’s relatively lower than Transcend’s range of mil-spec shock-proof external hard drives, the ADATA Dashdrive Durable HD710 could be a smart choice for students, frequent travellers and of course, clumsy people.